These three businesses offer above-average growth opportunities for long-term investors. Sometimes it's easy to spot great growth stories. Apple, Amazon.com, and Netflix are prime examples. Other times, the best growth stocks to buy aren't so obvious. That's been the case with boring old water heater manufacturer A.O. Smith, which has delivered a 10-year return of 934% with dividends included -- and that includes a 30% slide since the beginning of 2018. No matter where you find great long-term businesses to own, holding even one epic growth stock can drive the gains of your entire portfolio. Knowing that, we asked three contributors at The Motley Fool for their best ideas. Here's why they chose U.S. Silica (NYSE:SLCA), Shopify (NYSE:SHOP), and Wynn Resorts (NASDAQ:WYNN). Will this bottleneck lead to a gusher of growth? Maxx Chatsko (U.S. Silica): Oil and gas producers have taken advantage of new technology and favorable economics to drill hundreds, and sometimes thousands, of wells in each major shale region. But there's a catch: They can't complete the wells and put them into production until more pipeline capacity is added to take the crude oil, natural gas, and natural gas liquids away. Since a steady supply of frack sand isn't needed until wells are completed -- and there were a record 8,545 drilled but uncompleted (DUC) wells in mid-October -- that's a problem for U.S. Silica. It's a big reason shares have lost 63% of their value since the beginning of 2018. While the anxieties of Wall Street are understandable, the business isn't struggling nearly as much as the stock price reflects. In the first nine months of 2018, revenue grew 38% over the year-ago period. An asset impairment led to an 8% decline in operating income in the comparison period, although it grew 5% when that's excluded. A more legitimate concern would be rising interest expense, which grew 104% in that span and sapped net earnings. The acquisition of EP Minerals, an industrial ceramic business that will diversify revenue away from oil and gas customers, explains that surge. It will need to begin delivering higher income to mitigate the effect of interest payments on the bottom line. All of that said, there's a lot for investors to look forward to. The number of DUCs should begin to trek lower in 2019 as multiple major pipeline projects come online, notably several in the Permian Basin. That should lead to higher sales volumes, while U.S. Silica's last-mile logistics business guaranteeing on-time deliveries to customers could also be a boon for business. Meanwhile, progress continues to be made integrating EP Minerals, which should lead to a further drop in operating expenses. The recently announced price increases of 2% to 9% for the industrial segment that go into effect on the first day of 2019 should also boost earnings. Given the growth prospects and a dirt-cheap stock trading at 0.7 times sales and a PEG ratio of just 0.10, investors should strongly consider U.S. Silica stock. Todd Campbell (Shopify): E-commerce sales grew 14.5% year over year in Q3 2018, according to the Bureau of Labor Statistics (BLS), and I suspect growth will be as strong in Q4 given holiday shopping trends, if not stronger. If I'm right, then this is a great time to add Shopify to portfolios following a recent decline in its share price. Shopify helps retailers manage traditional retail and e-commerce platforms seamlessly, providing them with a digital presence and tools that allow online payments, integrated inventory tracking, real-time analytics, and marketing solutions. The company's business is humming along nicely, with sales growing 58% year over year to $270 million last quarter, and importantly, the company's finally at a point where its scale is starting to deliver bottom-line profit. In Q3, the company's adjusted net income was $4.5 million. Based on its third-quarter performance, management thinks sales will be $1.045 billion or better and non-GAAP operating income will eclipse $8 million for the full year. The BLS estimates that, despite its growth, e-commerce still only represents less than 10% of all retail sales. Since Shopify has ample opportunities to cross-sell solutions and grow merchandise volume on its platform, I think it's fast-becoming a must-own growth stock. Shopify will never be confused with a value stock on traditional metrics, but it is trading about 8% below its summertime peak and that makes me think buying it before it reports its post-holiday earnings is smart. Travis Hoium (Wynn Resorts): One of the fastest growing companies in the gaming industry is Wynn Resorts, which recently expanded in Macau and has a new property near downtown Boston set to open in 2019. The company is one of only six concessionaires in the world's largest gaming market, Macau, and operates the most profitable property on the Las Vegas Strip, Wynn Las Vegas. Consider that the opening of Wynn Palace in Macau drove a 69% revenue increase over the past three years. And with $730.6 million of the company's $1.71 billion in revenue in the third quarter alone, Wynn Palace continues to be a big growth driver as it matures and takes market share in Macau. The two big growth projects on the horizon for Wynn Resorts will keep revenue and EBITDA moving higher. The $2.6 billion Encore Boston Harbor is due to open in mid-2019 and will be Wynn Resorts' first foray to the East Coast. 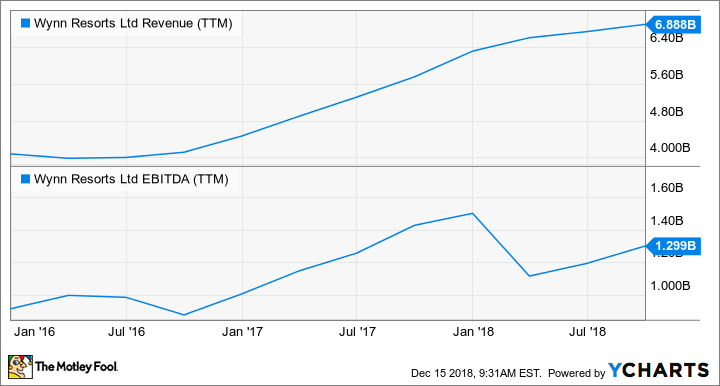 Given the new market, it's difficult to determine what revenue and EBITDA will look like, but given competitors' performance, I don't think it's out of the question to expect at least $300 million in EBITDA annually. In Las Vegas, Wynn is expanding its convention facility to capitalize on a strong convention business on the north side of the Las Vegas Strip. Its position next to Las Vegas Sands' convention space and adjacent to the Las Vegas Convention Center is perfect for additional space that will cater to Wynn's typical high-end clients. This should help drive additional traffic to the casino and keep hotel rooms full during the week. Wynn's shares have struggled recently as Macau's gaming revenue has plateaued and the company itself has faced a full turnover in management. But long term, the company still has some of the best assets in the gaming industry and will only grow those assets over the next year, keeping the growth train going.